This weekend we attended the wedding of two of our good friends. I was thrilled to attend the ceremony and to wish them all the happiness for their now joint journey. I was also very excited, because our friends asked our help to babysit the apple of their eyes, the ring-bearer, Zsófi for a day. 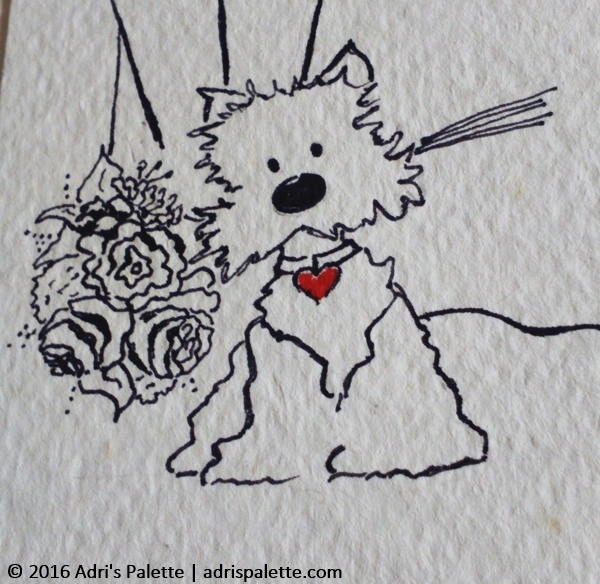 As I knew how much this little fluffy Westie girl means to them I decided ahead of time to make something special for our friends. 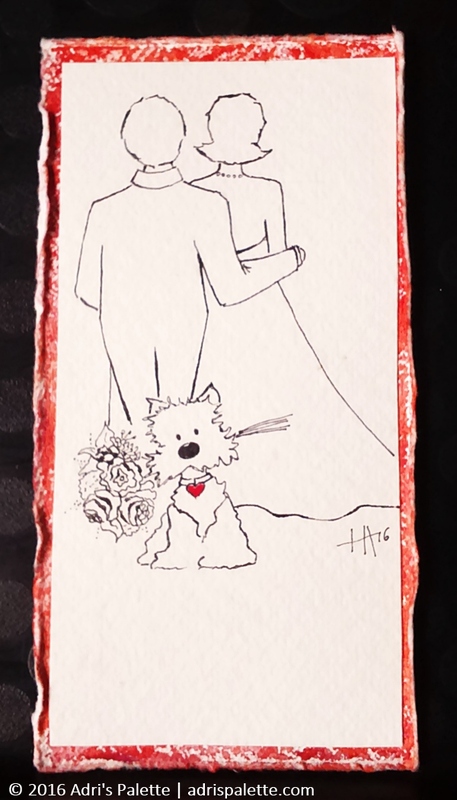 We wanted to give them a gift card as a wedding present and I thought it would be a great idea to put it in a card that I made for them, a card where Zsófi would be the central figure. I doodled a bit and came up with a sketch. I really liked the little gal, but was not really happy with the figures in the background. So decided to explore that further. But the figure of the dog stayed as I imagined her first. I struggled with the bouquet. I didn’t want it to be nondescript, or to turn it into a cliche of roses either. I looked for ideas to a florist I follow on Instagram, a true artist. I find fleuriste-miyabi to be so inspiring! So incredibly different in style, textures and colors than what I am used to, but she represents everything I crave for. So after much deliberation (and umming and ahhing) this bouquet of hers ended up being the inspiration. Once the figures were done, the card was finished I decided to frame it. 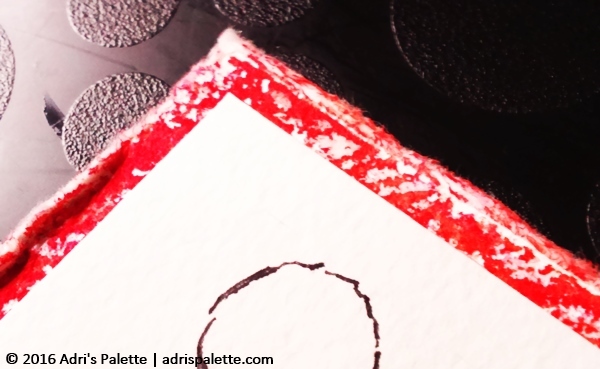 I glued the card onto a hand made paper that had lots of texture. Once painted over with watercolor it gave a really nice splattered effect. I liked how the splash of color the little heart that featured on the collar now had a contrast. It brought it out and made it even more pronounced. Also, this little frame provided the opportunity for two slits that held the gift card on the back. 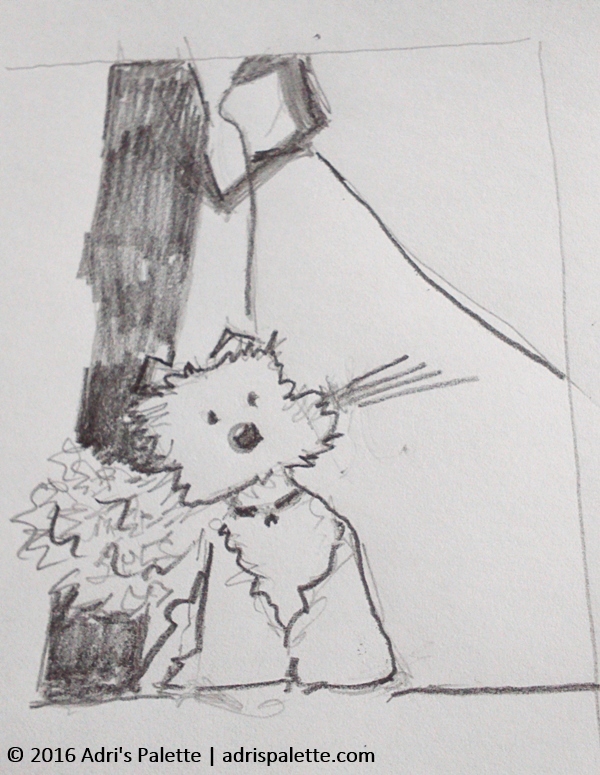 When I finished with the drawing of the little doggie I immediately saw the similarity to a famous Gaul cartoon Westie. So decided to take the plunge and make the characters cartoon-like as well. I mean, a marriage is serious, but you also have to have fun and laugh at things. And why not start right on the wedding day?! Lots of kisses and love M & A… and to the little Pea.